The chart for discussion comes from a deeper look at the so-called “SCANNZ Economies” in a recent edition of the Weekly Macro Themes report, where I looked at the key risks, triggers, and vulnerabilities. 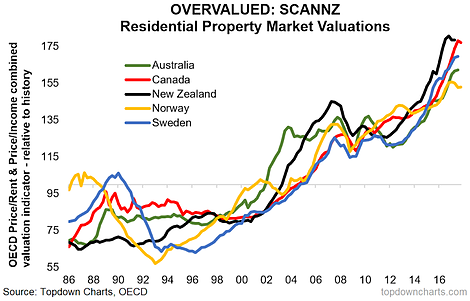 The chart below shows residential property market valuations for the SCANNZ economies, and should make it fairly easy to understand why I have grouped these countries together! The key similarity that these countries share is overvalued property markets. But actually that’s not where it stops. They all are relatively small, open economies, with their own currency, and an independent central bank. They also share a common feature of export sensitivity and undertake significant exports of commodities. It’s important to keep all of these factors in mind, because as I will explain, they tie intimately into the property market situation. Through the 2000’s the SCANNZ economies underwent major property price booms, culminating in overvalued housing markets. Around 2014-15 commodity markets went into tailspin and global trade slumped – naturally the central banks of the SCANNZ economies cut interest rates. What happens to housing markets when you cut interest rates? People can borrow more, and they do, and house prices go up. What’s interesting is that all 5 of these economies didn’t really see a major reset in valuations in the wake of the financial crisis, so when you got this second wave of housing appreciation it took already overvalued markets and extended them even further.